Be the first to share your favorite memory, photo or story of Terri. This memorial page is dedicated for family, friends and future generations to celebrate the life of their loved one. 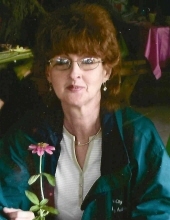 Terri Lynn Reagle, 64, of Polk, passed away surrounded by her loving family on Tuesday, March 19, 2019 at her daughter's home in Franklin. Born on July 5, 1954 in Franklin, she was the daughter of the late Chester Dale and the former Mary Lou Fleming. Terri worked for the Venango County Housing Authority from 1981 to 1994 as a Director and H & R Block and Mountain Bay from 1996 to 2001. In 2016, Terri retired from the Oil City Housing Authority as the Manager of Towne Towers after 13 years of working there. Terri enjoyed giving back and loved being active in her church; she was also very proud of her faith. Terri was a member of the Grace United Methodist Church of Rocky Grove, where she helped with the "Keenagers" program. She also was a part of the "We Care" Ministry at the Galloway United Methodist Church, which provided means to those that were sick. Terri also loved being with her family and friends. The times she spent going on shopping trips with her daughter, and the trips made to the casino with her father, sister, her cousin, Cherie Riddle, and her best friend, Mary Braden, will always be fond memories. Most of all, Terri cherished the time she spent with her children and her grandchildren. Terri is survived by her step-father, Darrell Heffernan; her son, Elliott D. Reagle of Franklin; her daughter, Lisa R. Shook and her husband, Donald W., of Franklin; her five grandchildren, Jaydon M. Shook, Ayva R. Shook, Alexys L. Shook, Ally N. Shook, and Kamdyn Reagle, all of Franklin; her brother, Chris R. Heffernan; her sister, Susan D. Burger and her husband, Braden, of Cooperstown; her special friend, Mary Braden; and her long-time love, Jack Martin, of Cairo, Missouri. Family and friends will be received on Friday, March 22, 2019 at the Gardinier Funeral Home, Inc., 1315 Chestnut Street, Franklin, PA 16323, from 9 am to 12 pm. Funeral services for Terri will be held on Friday, March 22, 2019 at the Gardinier Funeral Home, Inc. starting at 12 pm (noon), with Gretchen Johnson, a very good friend of Terri's, officiating. Interment will be held at Franklin Cemetery. In keeping with the memory of Terri, the family suggests that those that wish to contribute just "pay it forward". It doesn't have to be a monetary amount or a material possession, but could be as simple as an act of kindness towards another person. To send flowers, cards, online condolences, or for further information, family and friends are invited to visit www.gardinierfuneralhome.com. To send flowers or a remembrance gift to the family of Terri Lynn Reagle, please visit our Tribute Store. "Email Address" would like to share the life celebration of Terri Lynn Reagle. Click on the "link" to go to share a favorite memory or leave a condolence message for the family.